Lot of people say your school days are the best days of your life, but what do you like the most about your school? Do you love seeing your friends every day? Maybe you've got great teachers who make all your subjects fun? Is there a special project at your school that you think is a really good idea? Just complete the sentence and win exciting prizes. 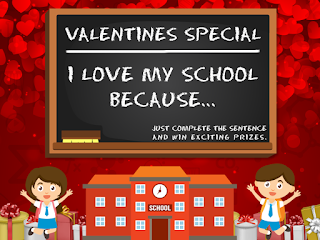 Here is the Link for our Valentines Contest. Contest begins February 10th, 2016 and runs through February 14th, 2016. Winners will be announced on 16th Feb 2016. You can also take any of your memorable photo’s from your school days and upload it to Instagram with fun filters, photo angles, materials, textures, lighting, etc. Make sure you include the hashtag, ‘‪#‎robomateplus‬’ so the photo is eligible for judging! Please ensure following points are met to get nominated for the Prize. • Remember to like us on Facebook and Twitter, to be considered for the nomination. • Fill in all the fields in the form, to be considered for the nomination. • Fill up your address and contact details correctly in order to receive the gifts via courier.